Throughout American history, the Cowboy has been a masculine symbol of austerity, independence, and strength. However, it's not enough to just call the Cowboy "a" symbol. John Wayne, Clint Eastwood, and the Western film explosion of the 20th century made sure that the Cowboy was "the" symbol for what an American male should be, to the extent that even today, phrases like "cowboy up" and "man up" (often spoken when a male shows any signs of emotion or pain) are synonymous. However, the 21st century, and especially the 2010s, has seen a shift away from this hardened male mindset, in many cases rebuking it. Yet the Cowboy lives on, this time under the guise of "strong, independent women". While the rise of female leaders in the West has been an important correction in society, as always, we tend to overcorrect, leading to the rise of these same Cowboy traits being encouraged in women. But the hardships and downfalls of these character traits are not gender-specific, and this is the realization Mitski makes on Be the Cowboy. Specifically, Mitski focuses on the loneliness of a "lone ranger" lifestyle and expresses it profoundly through the musical choices accentuating her lo-fi indie rock aesthetic. The spare piano of "A Horse Named Cold Air" and the distant, spacey synths on "Pink in the Night", for example, create the feeling of vast, bleak expanses. Similarly, the classic '60s country/folk stylings of "Lonesome Love" and the western guitar tones on "Why Didn't You Stop Me" allude to the Cowboy aesthetic as Mitski laments on the latter, "I look for a picture of you / To keep in my pocket / But I can't seem to find one." Even when Mitski dances on highlight single "Nobody", she dances alone. Though the disco beat pounds like it was made for the club and the guitar shuffles as though Nile Rodgers were playing it, Mitski sits at home lamenting with Morrissey-like melancholy, "My god, I'm so lonely / So I open the window / To hear sounds of people." It sounds socially awkward and simplistic to seek social connection this way, but in an age where social media is leading to more and more people feeling disconnected, the simple call to engage organically is an important one. Mitski carries this air of innocence elsewhere too, often just seeking the tenderness of a kiss over the typical rock 'n roll "cures" for the blues. Her childlike approach is endearing on closer "Two Slow Dancers", where olfactory-triggered nostalgia of school gymnasiums brings about the conclusion, "It would be a hundred times easier / If we were young again." It's clear that this longing for innocence and simplicity is the consequence of frustrating social constructs, gender roles, and expectations placed on us by the people around us. Whether female or male, the symbol of the Cowboy as a role model for stoic strength and individualistic independence chokes out the essence of who we are. 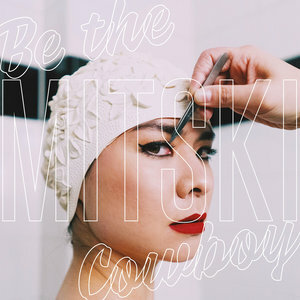 Instead, Mitski argues from the very first track "Geyser" to the end of Be the Cowboy that we are meant to be emotional people, although pent-up human emotions are never released as majestically as this electric explosion.